Congratulations on getting started with Smart Shipping Bar! In this article, we'll go over everything you need to know to create your new bar. Let's get started! Here, you'll want to select a name for your bar, and a cart goal. The name will only appear internally within the app (only you will be able to see it) so it doesn't need to match your storefront - but if you plan to have more than one bar, it's a good idea to name it something memorable so that you'll know which bar it is. The 'cart goal' will be the amount of money you want your customers to reach in order to receive a discount. As they add products to the cart, the amount displayed in the bar will decrease, based on how much they need to keep spending. Our default number is $50, so make sure you change that up when you've got a discount in mind! You can choose to show your bar to all countries, or you can restrict it so that it shows only for certain countries. This is a great option if you want to create multiple bars to advertise different shipping discounts in different countries! When selecting 'Only display to visitors in specific countries', a drop-down menu will appear, where you can type in the country you wish to display the bar in. If you select the wrong one and wish to remove it, simply click the grey 'X' icon on the right side of the country name. Note: Keep in mind that when you're targeting a country that you don't live in, you will not see these bars from the storefront - but you will be able to preview them by using the 'Preview' button on the dashboard! Next up - selecting messages! This will be the information you want to provide to your customers about the deals to be had. There are three messages to write: Initial message, Progress message, and the Success message. The 'Initial message' is the first state your customers will see the bar in. This is a good spot to write what the discount will be if they reach a certain cart amount! The default message is "Free shipping to all US orders of $goal$ or more" to guide you down your discount path, but feel free to remove that message and replace it with whatever you want! Make sure to use $goal$ as the placeholder for the cart goal amount you specified earlier. 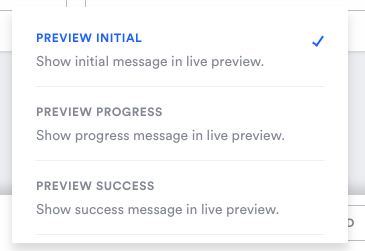 Next up is the 'Progress message'. This message will appear as customers are adding products to the cart. The $goal$ number will change from the original cart goal to the remaining amount of money they need to spend in order to receive the discount! Last, we have the 'Success message'. This will appear once a customer has finally added enough products to their cart that they now receive the discount! This is a great way to reward your customers with congratulations. No need to include the $goal$ in this area! Below the messages, you'll see an option to "Link entire bar to webpage" - this setting will allow you to make the entire bar clickable. You can use this feature to link to a page in your store if you want! The style section is the fun part! This is where you'll be able to customize the look of your bar. 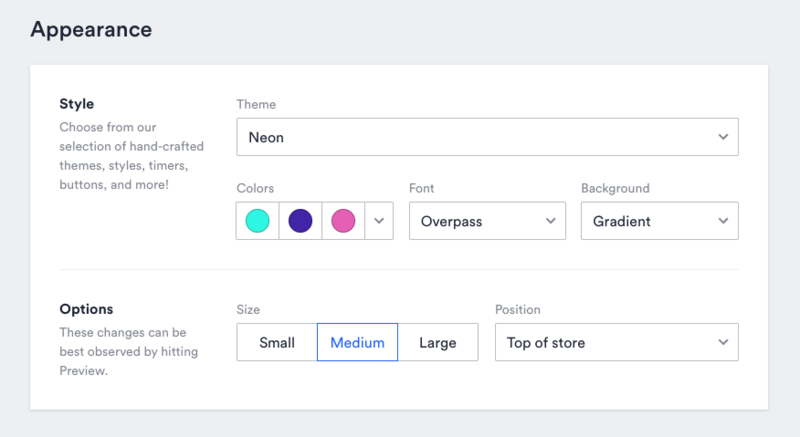 We've got a bunch of style options that you tailor your timer to your brand and store design. 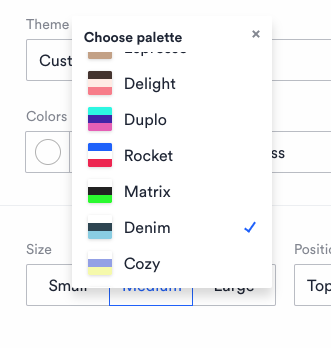 We have a bunch of pre-set theme styles to choose from, but if you'd like to choose your colors and customizer this to your own store, you can choose from Colors, Font, and Background options. Note: if you are on the Basic plan, you only have the option to use the Neon theme - for more options, we suggest upgrading your plan! The first option to choose from is Theme. Theme refers to the curated set of colors and backgrounds we've prepared for you. When you click on Theme, a dropdown will appear allowing you to preview your options. You can click on each option and see it update in the preview example at the top of the page. 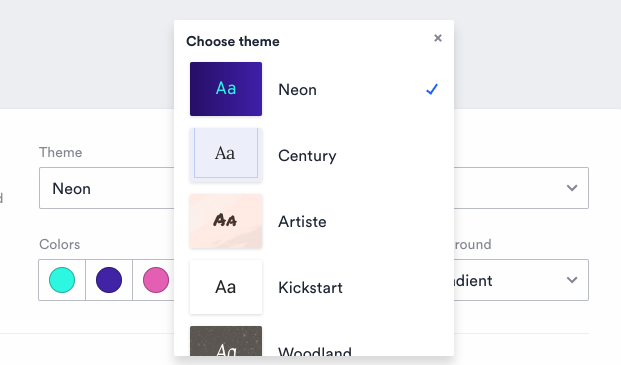 If none of the theme options strike your fancy, you can create your own either using the custom color pickers (they're labeled for the different components) or by clicking the down arrow and choosing a pre-fab palette. You'll find these options under Colors. Next, you'll choose a font from the curated selection under the Font menu. 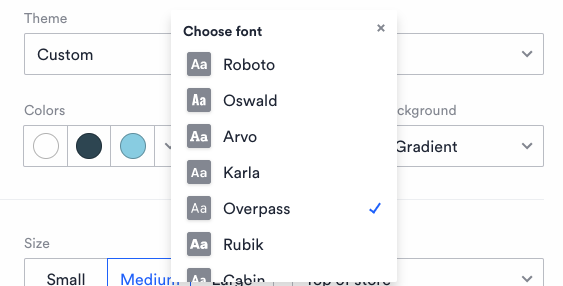 All of the fonts offered in Smart Shipping Bar are found in the Google Fonts library, meaning they will be supported by any modern web browser. Choose the one that fits best with your site design and bar content. You can customize the background of your bar by using the Background dropdown menu. This is a great opportunity to match your timer to your promotion. Holiday sale? Use the Snow option. Anniversary promotion? Throw some confetti up there. Note that not all backgrounds will show up with all colors. If the primary color of your timer is particularly light or dark, the contrast might not be enough for the pattern to display properly. Sorry about that. There are a couple of other ways you can customize the appearance of your bar - namely, Size and Position. The three Size options affect all aspects of the bar, from the font size to the size of the countdown elements to the total space the bar occupies on your site. Click through them to see their affect on your bar. The Position dropdown lets you choose from three options: Top of website, Fixed to top of window, and Fixed to bottom of window. Unfortunately, you cannot see the affects of these options in the live preview and will have to manually preview it on your website later. For now, know that the options are fairly self-explanatory, with Top of website placing the bar at the top of your website, while Fixed to top of window and Fixed to bottom of window will place it as fixed on the top or bottom, keeping it in view at all times while you're scrolling up and down the page. If you have a specific style in mind that we don't support and you're proficient in CSS, we've got just the thing for you: an in-line CSS editor! 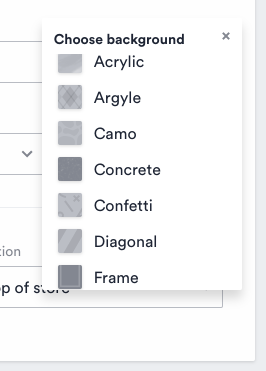 Hit the Enable custom CSS to add your own styles checkbox and a little in-line code editor will appear where you can add your own styles and override ours. It's even set up to validate your CSS and help you out with your formatting as you type. So clever! The changes you make with your custom CSS will appear in the live preview so you can make sure they work as intended. When you're satisfied with your bar, you'll want to publish it to your store. At the bottom of your window, on the right, you'll see three options: Preview Initial, Published, and Done. This button will allow you to preview the various messages you've set your bars with earlier in the editor. When you click the 'Preview Initial' button, you'll see a menu open up with three options - Preview Initial, Preview Progress, Preview Success. You'll see the bar you've created up top switch between each of these messages. This button will let you choose to keep your bar as either a 'Published' or 'Unpublished' bar. If you select to keep it as 'Published', it will appear on your storefront right way. You will also see it saved in your app dashboard. Selecting 'Unpublished' will save the edits you've made to your bar, but will keep it as an unpublished bar - so it will not be visible to your customers! That's it! You're all done! You can click this beautiful 'Done' button and get ready to watch those carts fill up and the sales roll in.